LE Chatelier Water Bath for Concrete Testing - Double walled inner chamber in stainless steel outer chamber in mild steel temperature range Ambient to 100°C controlled by capillary thermostat. Accuracy ± 1°C operated on 230V A.C. Single Phase. These baths are suitable for washing Marshall specimen. Lid is made up of stainless steel with a hole for glass thermometer to penetrate. Following sizes are available : a) 12\" length x 9\" width x 7\" height having rating 750W. 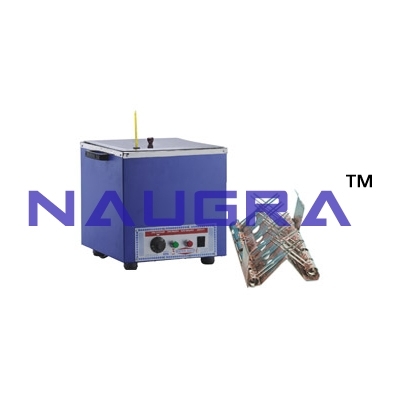 b) 18\" length x 12\" width x 7\" height having rating 1500 W. Customised sizes also available..
We are leading manufacturers, suppliers & exporters of LE Chatelier Water Bath For Testing Lab for Cement Testing Lab. Contact us to get high quality designed LE Chatelier Water Bath For Testing Lab for Cement Testing Lab for schools, colleges, universities, research labs, laboratories and various industries. We accept bulk orders for government tenders in all countries around the globe. For similar products visit at main page of Cement Testing Laboratory Equipments.